Poetry chapbooks, in case you’ve heard the term and still find yourself puzzled for lack of definition, are nothing more than small collections of poetry. They can be self-printed, published independently or otherwise, and range up to about 40 pages (but generally vary between 10 and 25 in my experience). While chapbooks have a history that stretches back to 1553 (according the Wikipedia page), their purpose – the perpetuation of philosophy, history, and art – remains poignant to this very day and should be credited with saving the soul of poetry in a world where seconds equal cents and “wasting” time trying to figure out what you’re reading makes no sense at all to most readers. Few have as hard a time hawking their wares as poets, especially given poetry’s currently and consistently plummeting popularity. The gleam of sunlight reflecting from jewels and precious ore may catch the attention, complements, and business of passersby at a street fair or mall. Inventions of metal or wood can be imagined to lend either to an appreciated décor or functional appeal of a given space while browsing a store or workshop. Songs bought out of inspiration can set or reflect a mood and keep us company during travel. Framed photographs and paintings acquired at local coffee shops or the local Frame-It shop make empty walls look less empty while appropriately (hopefully) complementing or contrasting the surroundings as per the purchaser’s desire. Most chapbooks produced today, as an aesthetic contrast, are saddle stapled/stitched. This means nothing more than paper folded in half and stapled/sewn along the resulting seam. Constructed thus, chapbooks consequently get squished and dissolve into bookshelves when placed amongst the relatively massive, perfect bound and hardcover tomes with actual spines (the side of a book with printable area at least wide enough for author’s name and book title). So the compact, nigh-unidentifiable volumes known as chapbooks, dense with the eager ink of emerging artists typically not on publishers’ radar screens, represent nothing other than sheer reading value. No-one will point out a chapbook amidst an established collection comprised of perfect-bound or hardcover books to crown an attempt at impression. Aside from the inevitable “who?” one would get when listing names, there’s the aforementioned aesthetic issue; most chapbook covers are usually the same color as the pages within (though some are lucky enough to get color paper covers) and bear an air eerily close to photocopied pictures leftover from the office party that everyone would rather forget than display in their bookcases. But if amidst the quest for consumption of words consumers are concerned about aesthetics, they are completely missing the point. Unlike the vinyl/CD/MP3 argument, the quality and effectiveness of words (for better or worse) do not change depending on format. Whether reading via Web browser, eReader (Kindle/NOOK), hardcover, paperback, chapbook, leaflet, or bar napkin, the power of words can only be as potent as the writer’s skill coupled with the reader’s subjective experiences and vocabulary comprehension. Production value is not meaningless however; judging a book by its cover can cause readers to pick up a volume and investigate the publisher. If not self-published, books are generally edited to a professional degree. Does this make the content better? To whom? Does the author’s voice undergo academic homogenization, or is it amplified by the removal of lumps felt by second opinions? Only the readers and their tastes can tell. Because chapbooks can be printed at home and reproduced on the cheap via local copy shop, there exists a certain degree of skepticism as to the depth of editing that went into said compilations. While this prejudice holds the efficiency of words to the highest standards, and I appreciate such a pedestal-like honor, especially regarding poetry, the facts are that life is short and almost nothing comes out right first the time around. Walt Whitman, the father of free verse, self-published “Leaves of Grass,” which went on to be re-imagined via five or eight subsequent editions (revisions). Within their productive lifespan, depending on when they start writing, poets are lucky to create a score of poems deserving of critical praise let alone worthy of surviving centuries. If so many poems in books of those referred to as canon poets aren’t the best things ever, why were they included? 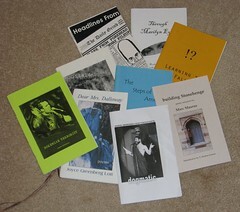 More importantly, why are chapbooks, which give an immediate, unfiltered taste of a poet’s work, so looked down upon? The poems therein might or might not be the best, but like those “other” poems amongst classics of canon poets, they might reach people. Requiring minimal production costs, chapbooks let poets spread their unique version of the word via an immediately identifiable and effective vernacular. The quality of the poems in any book can be debated, but the fact that chapbooks are inexpensive intros into contemporary poetry that foster readership for an art literally dying for any appreciation cannot. 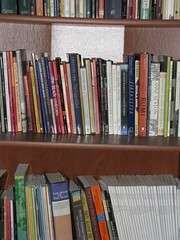 So create a section just for chapbooks on your shelf or make them mingle with their otherwise-bound brethren. Just make a point to remember the authors; you may want to reread that booklet someday or share it with someone who loves words as much as the author did that necessitated he or she print out their mind and heart and sell them to you for pennies per line.